Abu Dhabi: From discovering small cracks in the aircraft engine during checks to installing bolts in the wings due to their relatively small and flexible hands, these women have the upper hand when it comes to the little details. 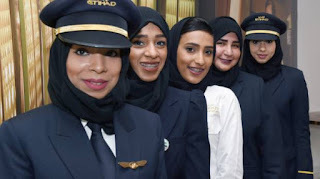 Gulf News talked to five Emirati women completing their aviation courses and on-the-job training through Etihad Airways. As the field of aviation maintenance engineering continues to grow, women working in the field are urging others to join them in this male-dominant career. These women, ages between 21 and 29, believe that men and women complete each other in the workplace. Always encouraged by their male colleagues, the trainee engineers believe that a woman’s attention to detail helps her compete in a man’s world. 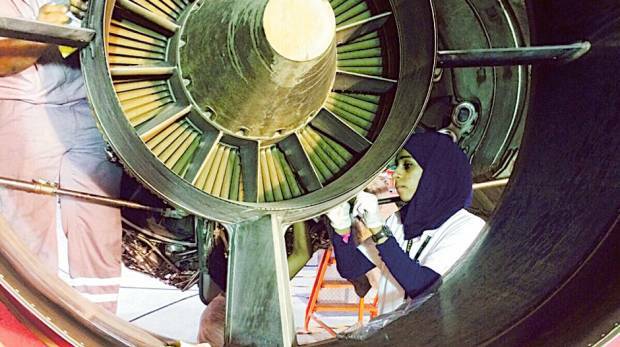 “Men have more skills in certain areas and women are better in others, but overall, they complement each other,” Khadija Al Noamani, a 23-year-old trainee engineer, said. There are parts of an aircraft women are not allowed to deal with because they could have long lasting consequences on health and fertility. “We are not allowed to go inside the fuel tank because of the chemicals used. We aren’t allowed to deal with the rudder either,” Khadija said. Safety is paramount when working on an aircraft. 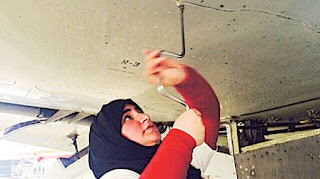 “You will find the words, ‘safety first’ plastered throughout the hangar,” Fatima Al Hammadi, 23, also a trainee engineer, said. Fatima removing the access panel on the wing of an Airbus A320. Fatima chose aviation because of a “passion to challenge myself and do something different”. Fellow graduate engineer Muna Abdul Kabeer, 27 reflected on their journey of applying to the field of science aviation maintenance technology. “We had to attend the Abu Dhabi Men’s College; this is how lacking the field is in women. There was only one woman who studied this particular major before us, and all three of us made up the second batch” she said. 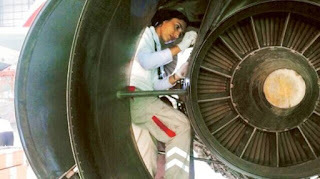 Muna removing the exhaust nozzle of an engine in an A320. On occupational risks, Muna said: “Two weeks ago I had to wear my harness and be pulled up to the engines. It’s really dangerous, but exciting. You never know what you’ll be doing when you come in to work. I often forget that I’m hungry, or tired,” she said. 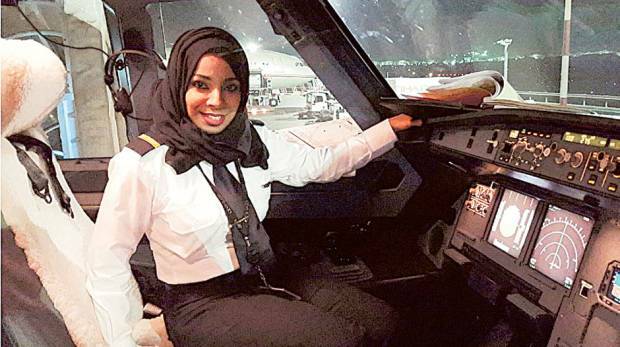 Rasha Saeed, 29, currently a second officer (co-pilot), gave up her job as a bank manager, to pursue aviation because she saw herself in her sister who became a pilot. “While working at the bank I would always take two days off every couple of months or so because I needed to travel and fly,” Rasha said. She thought it was too late for her to become a pilot, but stumbling upon an advertisement for Etihad’s training programme, a co-worker applied on her behalf to take the entrance exam. “I was surprised to learn that I would be taking the test, but I decided to try and see what happens,” Rasha recalled. Training to be a cadet, Rasha found it difficult at first as the material was unfamiliar. “My first week was a disaster. I felt lost, but I told myself that I am in it now and I have to study hard … I set a goal in my mind to be one of the best,” she stated. One of the most exciting parts of training is the observational flights second officers have to sit through, she recalled. Rasha in the cockpit of an Airbus 320. An unforgettable route for Rasha was a flight that departed from the capital at 3pm and only returned in the early hours. Even though Rasha felt the pressure, there was always a sense of accomplishment at the end of each flight. As a cadet pilot, 21-year-old Reem Al Shamsi’s days are filled with studying, classes and practice as she charts her path to the cockpit. The youngest of the group, Reem reassured Emirati women that even if their families are not understanding in the beginning, it should not keep them from living their dreams. “When you show them that you’re good at something, they will eventually support you,” she said. If one is looking for support there is always someone within the programme, Reem revealed. The three main tasks of an aircraft maintenance engineer is to check, inspect and test the aircraft from the nose to the tail. This includes the engines, landing gears and flight control. At Etihad, there are 44 Emirati women pilots and cadets and 38 qualified engineers and trainees. The number of projected aircraft maintenance engineering jobs is expected to reach 480,000 positions globally by 2026 as a result of an additional 25,000 aircraft being brought into operation, according to the International Civil Aviation Organisation.